I had a read of the Reuters article before the poor little iPad2 crashed trying to run the embedded video. There have been plenty of conservative Catholic clergy who have stuck with the older stricter less Christian teachings or rituals of the Church when a “reforming” or “more enlightened” Pope has come along – at least as far back as I can recall from Paul VI onwards. 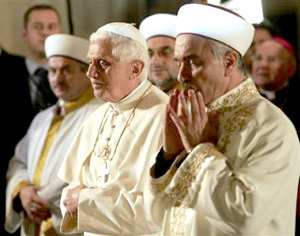 But the current Popes increasing flirtation with Islamic leaders is probably bothering some of the clergy better versed in Islam because Catholics are required to still believe completely in the divinity & resurrection of Jesus Christ, & Islam, while accepting Jesus as a prophet & having its own bizarre explanation of what happened to him at the crucifiction, completely denies his divinity. Popes and Christians can have any outreach they like except maybe satanism – & even then there might be some circumstances in which that might be judged acceptable – to turn adherents back to Christ, for example. I am saying only what I said, & no more. What I am saying is reflection of a couple of chats I’ve had with Anglicans & my own research into what Muslims believe about Jesus. The Reuters article I thinks talks of some Catholics being concerned that the aim of the Muslim faith is to take over eventually (or words to that effect. The two beliefs about Jesus each require devout followers to believe the other is wrong about the central figure of Christianity. I see these sorts of moves as misguided attempts at self-preservation. 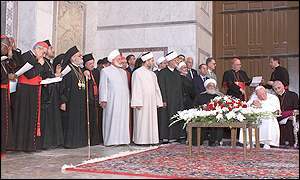 As well as tactical alliances against non-believers in the Abrahamic God, from which both derive their power over the ignorant or lost. Have a read then give it a rest eh? I imagine some people probably do but I don’t really care what either of them gets up in terms of attempting to pretend the differences don’t matter. Both of them believe in a scriptural God I see no evidence for. I had already decided for myself that SB and PB are childish and poor leaders. I’m not sure how SB of WO knows that those leaders were giggly and behaving scatter brained in caucus. Whale oil has his long time sources who were MPs. Nats 45, Labour 39, Greens 4, NZL First 3.5, New Conservative 1.5, ACT 0.5, the rest undecided. Maori might get a token 0.5% as well – the rest undecided/very small party support.